The left is howling about ICE. 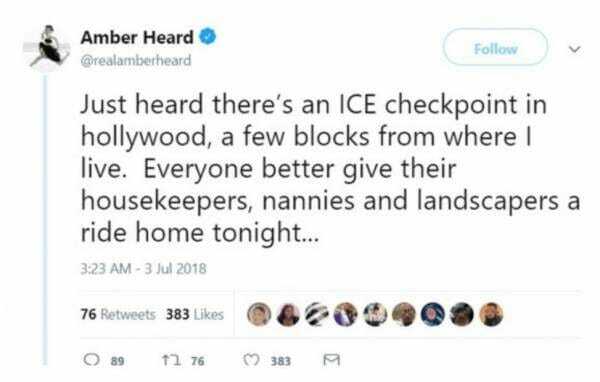 They want ICE gone and Hollywood actress Amber Heard gives an indication as to why. Those Hollywood elites do love their cheap labor wrapped up in racial hypocrisy. I think the “great” America we are aiming for, is one where people don’t assume landscapers, nannies, and housekeepers are illegal immigrants. How does it feel that EVERYONE knows that you reduced immigrants to scrubbing your toilets and mowing your grass. The “tolerant” celebrities are the worst offenders of racism after all. Funny.